A Hampshire County Council consultation is proposing changes to its Specialist Teacher Advisory Service, which provides support in schools for children who have hearing or visual impairments, physical disabilities or speech, language and communication needs. 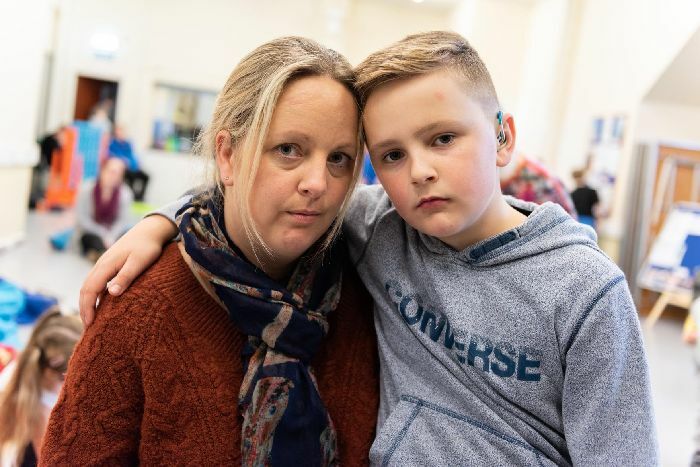 Emma Heaysman with her son Lewis, who she fears could suffer at school if Hampshire councillors approve 700,000 savings to its Specialist Teacher Advisory Service. Emma believes the council should be thinking about providing more services and ensuring there is continuity with advisers making visits. She said: ‘Deafness should not affect someone’s learning ability but many don’t pass five GCSEs at A to C, so they are under-represented already. If anything there needs to be more help and certainly not less. ‘Lewis has known his adviser since he was four and I think its a bad idea to have different ones as kids may then not be able to open up about the problems they are having.’ The National Deaf Children’s Society has branded the proposals ‘completely unacceptable’.